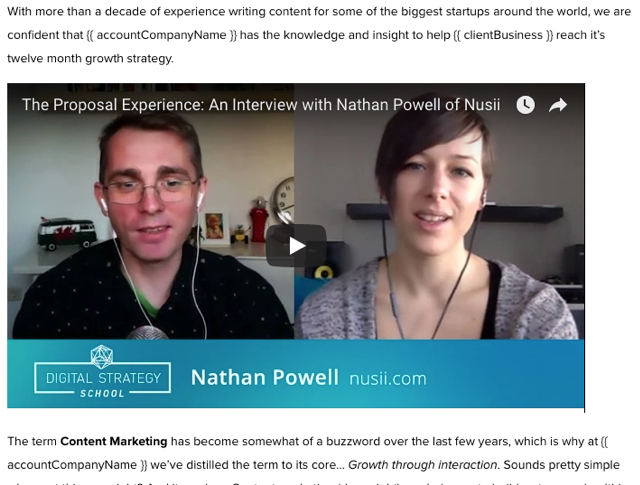 Video is a powerful way to convey a message, which is why we've made it easy to add video to your Nusii proposals. To add a video you must be in Edit mode. Once here, place your cursor in the appropriate place within your section. Click the Insert Video button. From here you have three option. You can Paste in a Video URL, Paste in an Embed code, or Upload your video file. Please note that the Embed and URL options are currently only compatible with Youtube and Vimeo. If you prefer to upload your video directly to Nusii, there is a file size limit of 30mb. If we take the example of Paste in a Video URL you can see that by pasting in our URL the video is resized to fit within your proposal. This is true of all three methods.